One hundred and thirty-five (135) Class 56 diesel locomotives were built between 1976 and 1983. The first thirty locomotives (Nos.56001 to 56030) were built by Electroputere in Romania, but these suffered from poor construction and many were withdrawn from service early. The remaining 105 locomotives were built by BREL at Doncaster Works (Nos.56031 to 56115) and Crewe Works (Nos.56116 to 56135). The class 56s were built to be used on heavy freight trains. They were fitted with a Ruston-Paxman engine developing 3,250 bhp. 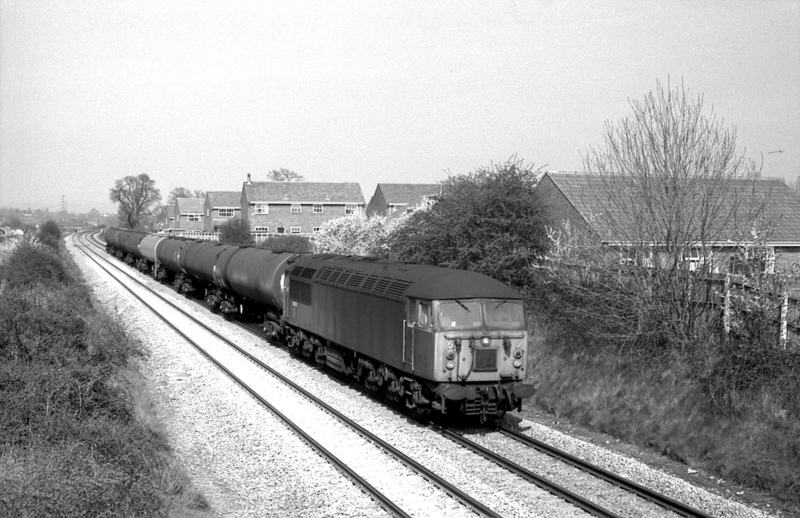 Class 56 diesel locomotive No.56078 (probably!) at Stoke Works with a southbound empty oil tank train on a sunny afternoon in December 1982. Photograph taken by Andrew Smith. 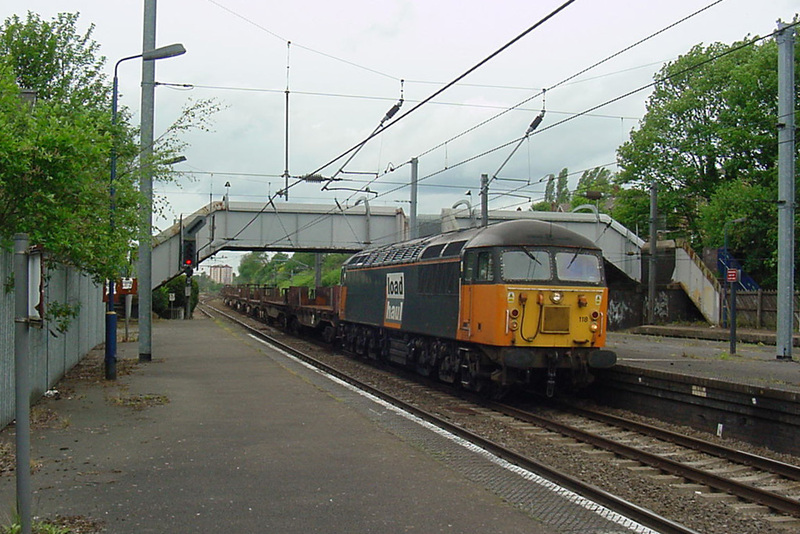 At Kings Norton on 21st May 2002 class 56 diesel locomotive No.56118 in Loadhaul livery has just crossed from the 'up' slow line to the 'down' fast line in preparation for taking the original Birmingham and Gloucester Railway line to Camp Hill . It is working an empty steel train probably from Margam or Llanwern to Lackenby. Photograph taken by Andrew Smith on 21st May 2002. 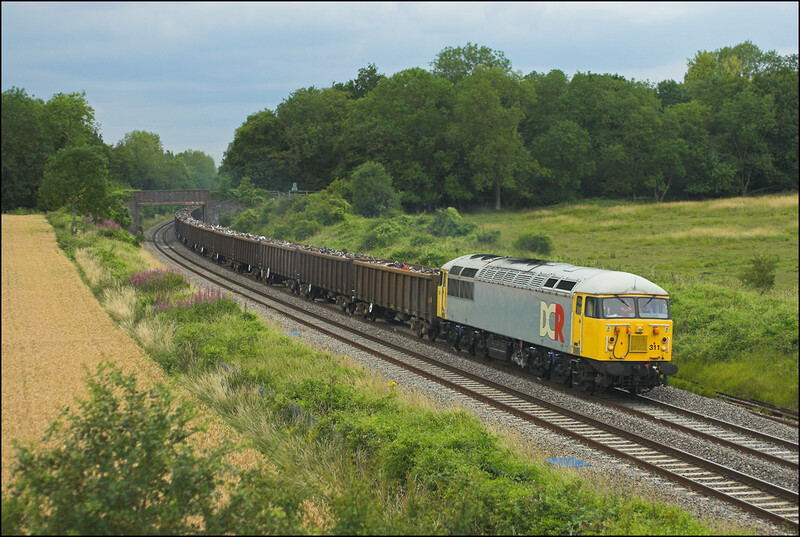 Peter Tandy has provided this photograph of one of the rarely used class 56s normally kept at Washwood Heath in Birmingham which ran light engine to Hither Green during the week commencing 3rd July 2011 in order to collect some scrap carrying wagons. These were taken to Grimsby and the locomotive then took a train of loaded scrap metal (code No.6Z56) to Cardiff Tidal. Photograph taken on 12th July 2011. See www.petertandy.co.uk for more of Peter's fine photography. 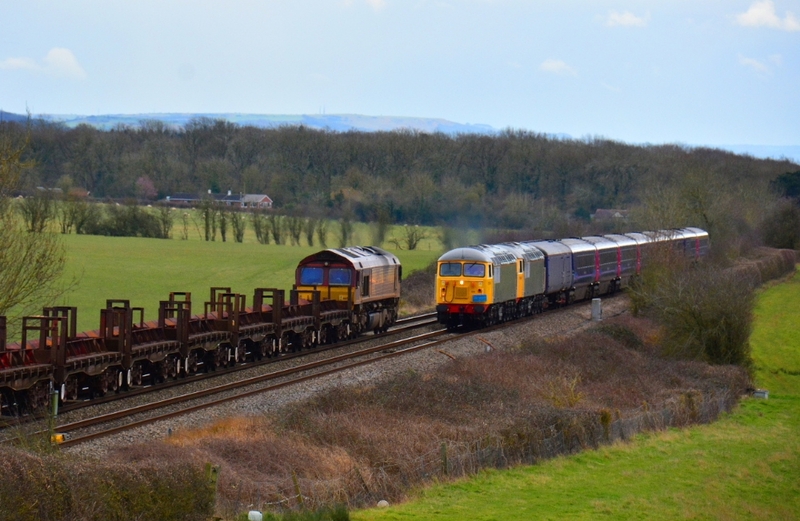 An empty stock movement of First Great Western carriages from Plymouth Laira to Kilmarnock (train code 5S56) on 4th March 2016 was heaed by a pair of class 56 diesel locomotives. Nos.56104 & 56081 are seen near Wadborough with class 66 diesel locomotive No.66035 passing in the opposite direction with the afternoon Corby to Margam steel coil empties.. Photograph taken by Steve Widdowson. The train was running over three hours early. Against all expectations the class 56s continued to be used, abeit in small numbers. 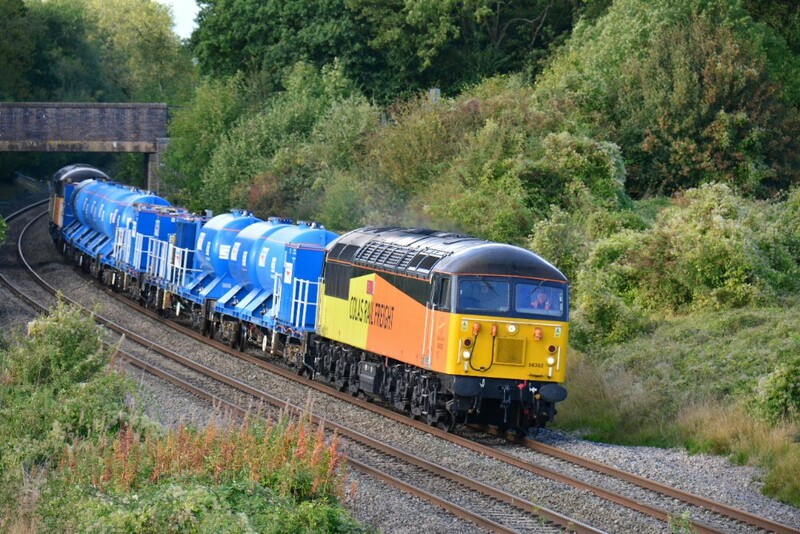 On 1st October 2016 Steve Widdowson was at Besford (Croome) and took this photograph of Colas livery Nos.56302 and 56078 with the 09.57 from York to Gloucester. 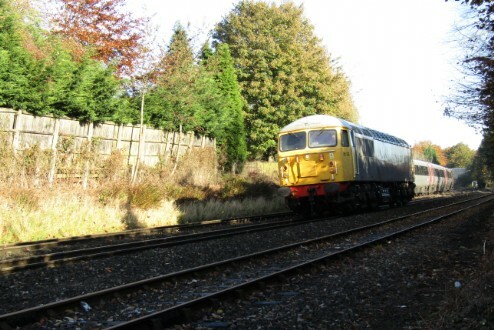 The photograph (above left), taken by Andrew Smith, shows class 56 diesel locomotive No.56104 at Blackwell, shortly before descending the Lickey Incline. The locomotive was on its way from Washwood Heath to Worcester for use on the Gloucester-based 2016 Rail Head Treatment train (RHTT 4). 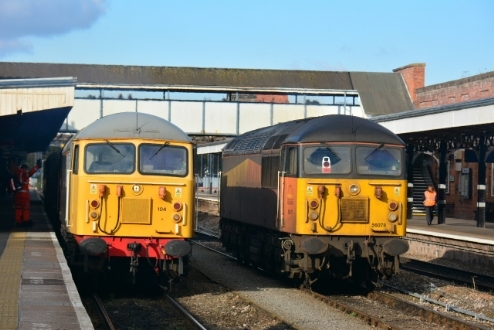 Steve Widdowson photographed it (above right) at Worcester Shrub Hill after it had replaced failed classmate No.56078 which is seen in the centre road. Both photographs were taken on Monday 7th November 2016.